"finish it all" I say. "please don't leave any leftovers, as they just become science projects in the fridge" is my request. Except when Claire visits. The other day I picked up 2 sides of pork from the butcher. Not yet pieced out it was really two sides, impossible to get into our coolers. The only stop was for ice to cover it. Homer pieced it out, wrapped it in freezer paper and put parts into the freezer. I took a piece of the fat to a chef who will render it to lard, and eventually a fig tart. A few pieces were cooked up and eaten by us right away. Fantastic flavor and texture. Claire asked if she could put a bit into the fridge, for later use. Hopeful there was not a science project in our future, we agreed. 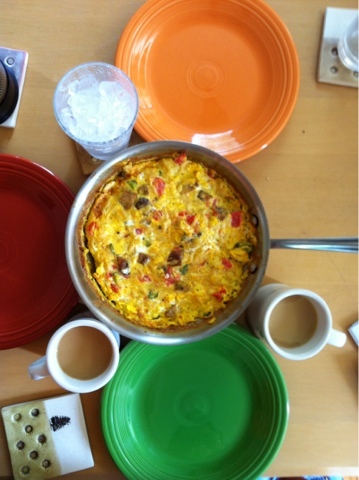 Yesterday a frittata appeared for breakfast. Eggs, pork, peppers, tomatoes, home made butter. Wow was it good, tender with a great mix of flavors and the right amount of heat. The pork was top shelf. The eggs were dirty and cracked, tomatoes half rotten, peppers were the broken ones. The butter was spot on. The rejects that do not make into our CSA shares turn out to be some awesome meals. And no mysterious furry items in the bottom of a bowl at the back of the fridge in our future.